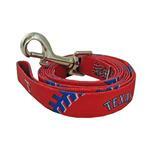 Show support of your favorite team with this officially licensed MLB Texas Rangers Baseball Printed Dog Leash! The leash is six feet long and 3/4 inch wide and has a metal clip for easy access on and off. Full color logos. Matching collar is also available, sold separately! Posted On 04/21/15 by Isabel S from Mesquite, TX Yes, Isabel S recommends this product! Love it! Big Rangers fan!! Great products for my therapy dog that does a lot of traveling. Everyone loves her clothes.